Sixty million years ago, the K-T Asteroid obliterated the dinosaurs, and now its apocalyptic twin is rocketing toward the US on a similar mission of extermination. Russian President Boris Lebed, the charismatic successor to Vladimir Putin, wants to turn that asteroid into a superweapon to use against the US and is holding Hamilton hostage in Moscow until Hamilton agrees to help. 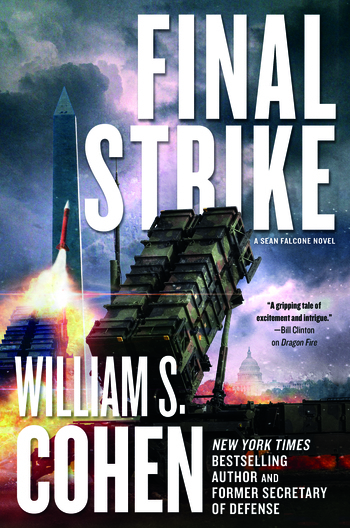 Former Senator and National Security Advisor Sean Falcone leads a dangerous off-the-books operation to bring Hamilton home and derail Lebed’s disastrous plan. But will Falcone succeed in time? The asteroid is hurtling toward earth. If it is not deflected, humanity will go the way of dinosaurs, and the entire planet will burn. Only one strategy has a chance of stopping humanity’s extinction—only one. There is no Plan B. “Here comes another knockout political thriller from a man who really knows his way around politics and thrillers, too. It’s rocketing toward you right now, with all the speed of the asteroid at the heart of the plot. So sit down, strap in, and start reading. This one has it all... good guys, bad guys, vividly drawn locations, huge scenes of breathless action, and as with all William Cohen's books, it will leave you thinking at the end... and that asteroid, too. Terrific entertainment. WILLIAM S. COHEN served as Secretary of Defense under President Bill Clinton from 1997-2001, making him the twentieth U.S. defense minister. Born in 1940 in Bangor, Maine, Cohen was a member of the U.S. Senate and Congress for twenty-four years. He has written for The Washington Post, The New York Times, and The Wall Street Journal, and is the author of the New York Times bestselling Dragon Fire. Cohen lives with his wife in the Washington, D.C. area.